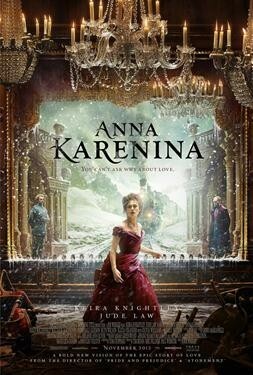 The third collaboration of Academy Award nominee Keira Knightley with director Joe Wright, following the award-winning boxoffice successes 'Pride & Prejudice' and 'Atonement,' is the epic love story 'Anna Karenina,' adapted from Leo Tolstoy's classic novel by Academy Award winner Tom Stoppard ('Shakespeare in Love'). The story unfolds in its original late-19th-century Russia high-society setting and powerfully explores the capacity for love that surges through the human heart, from the passion between adulterers to the bond between a mother and her children. As Anna (Ms. Knightley) questions her happiness, change comes to her family, friends, and community.